Home Color Ideas	Bright and Vibrant Wedding Inspiration! Bright and Vibrant Wedding Inspiration! Summer is the perfect time for a fun, bright and vibrant color palette! With so many ways to play with color this palette will have you twirling with delight! Check out some of the fun options on OneWed’s Bridal Blog, Savvy Scoop! To make this sherbet inspired bouquet we used Lilies and Daisies in shades of pink, green, yellow and orange. Click Here for Hot Pink Wedding Flowers! Click Here for Lime Green Wedding Flowers! Shop by Color to get inspired and find your perfect palette! Click Here for Bright Orange Wedding Flowers! Click Here for Golden Yellow Wedding Flowers! 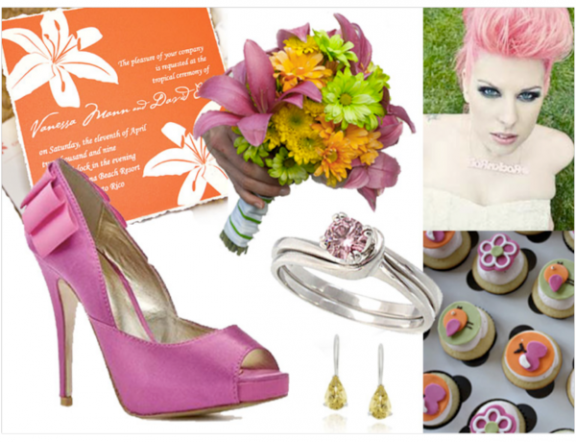 Photo Credits: Wholesale wedding flowers, pink engagement ring, pink wedding shoes, cupcakes, pink-haired bride, orange wedding invitations, yellow teardrop earrings. New Romantic Roses – 10 Percent OFF!